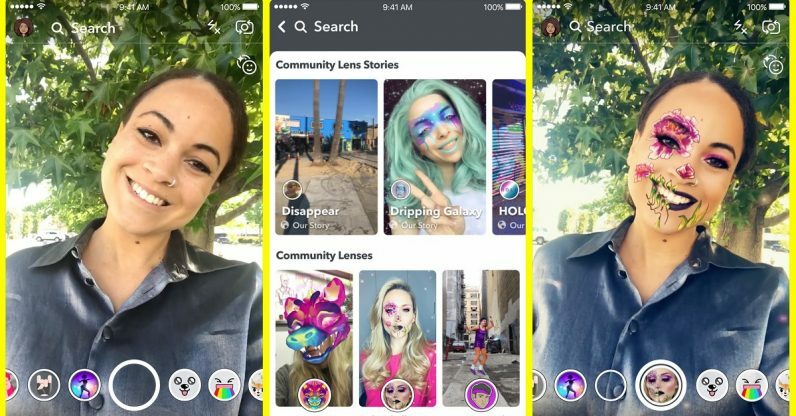 Snapchat today announced it was rolling out Lens Explorer, a new feature that makes it easier for users to tap into the growing market of community-made Snapchat Lenses. With this new feature, the company turns to the creativity of its users to differentiate itself from its competitors. The details: Lens Explorer is a new window, accessible from the main Snapchat camera, that gives users easy access to Lenses developed in Lens Studio, the company’s open Lens development kit. To access it, the user brings up the Lens carousel and then taps a button in the top right corner of the screen. From there, you can access the hundreds of thousands of community-made Lenses, and their varying degrees of quality. Previously, to access Studio Lenses, you had to use a Snapcode from the main Snapchat site or unlock it using the public Story that promoted user-made Lenses. Now they’re actually easy to find and use. Why it matters: As might be apparent from the plethora of times we’ve mentioned another social media service “ripping off Snapchat,” the ephemeral photo/messaging app is no longer as unique as it used to be. Its recent efforts are those of an app trying to find its feet in an economy where Instagram has taken a large bite out of its audience. Snapchat may have found a good buoy upon which to keep itself afloat: the creativity of its users. While Instagram is trying to innovate its platform with tools (and basically become YouTube), Snapchat is letting its users tinker with Lenses, currently its most distinctive and enjoyable feature. Lens Explorer is available on iOS at launch. According to the company, it will evolve over time, becoming more personal to the user — which, I presume, means it’ll show you Lenses similar to the ones you’ve already looked at.